BostonBruins.com - So, it's official, summer is dragging on and we're getting anxious for the season to get under way. Training Camp is just over a month away in early September, and waiting until then to check up on the B's summers seems like light years to wait. So, as the season carried into late June and July, we started thinking about how we could make the doldrums of the offseason move just a little quicker. And what better way to do that than take a road trip? Last summer, the idea of #BearTracks was born. In 2011, the travels with the Stanley Cup brought the BostonBruins.com crew to places all over North America and beyond, visiting players' hometowns and giving fans a glimpse at their lives off the ice. But Lord Stanley's tight schedule didn't allow for much discovery. 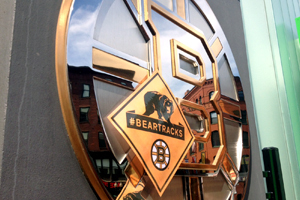 Thus, the #BearTracks trips allowed a chance for us to head out on the road and take you to these amazing places, and get to know the Bruins a bit better. There's something about seeing Gregory Campbell light up as he talks about his hometown of Tillsonburg and the rolling fields, a sanctuary away from the hustle and bustle, and as he walks you through his family's barn (straight out of Youngblood!) where he used to do chin-ups on the wooden beams. Or having Adam McQuaid drive through Prince Edward Island to Cornwall, where he grew up, describing how his roots helped shape him into one day becoming a Boston Bruin. Or seeing just how hard the B's work in the offseason, like Brad Marchand challenging himself in the weight room with a "no pain, no gain" attitude, and then having the forward take you on a tour of his favorite parts of his offseason home base of Halifax, Nova Scotia. Or how about learning that Patrice Bergeron may do everything he possible can on and off the ice, and he still finds time to delve into business ventures? Like having part ownership in a Nordic spa outside Quebec City. Oh, and poutine may not be on his nutrition plan for the summer, but he still knows the best spot in Quebec City for visitors to indulge in the cuisine. Last summer, #BearTracks took us to all of those places above, and more. One of Patrice's training partners, Jordan Caron, joined him on the visit through Quebec. We also visited Torey Krug - a year before his NHL playoff debut and the Kruuuuug's that would rain down from the TD Garden rafters - as he was making the transition from college to the professional stage. The recently traded Tyler Seguin and Rich Peverley were also among the visits, as we made our way around Toronto. So now, with just over two months until puck drop for the 2013-14 season on October 3, we're hitting the road again… Only this time, we're heading out West! Follow us all week, beginning July 30, as we bring you into the offseason routines of two Bruins who are already working hard preparing for next season. 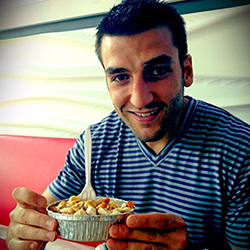 A member of the Bruins' core group, Milan Lucic will show us around Vancouver and let us in on his offseason training regimen. Then, we'll get to know the newest Bruin and future Hall of Famer, Jarome Iginla, in Vernon, British Columbia. I'll be tweeting @NHLBruins ^CS and we'll bring you updates via Instagram, Facebook, BostonBruins.com and the Bruins' mobile app. Be sure to join the conversation by using the hashtag #BearTracks. We'll have plenty of time in the car after we touch down in Seattle from Boston, so feel free to send questions and suggestions throughout our trip via Twitter. And who doesn't love a good suggestion for a food stop along the way? So send those as well! Watch the video below for a preview, take a look at BostonBruins.com for our favorite moments from previous trips, and then stay tuned for more from our #BearTracks trip out West!